While shopping on Etsy.com for a scarf I came across this cute neck warmer from cherylboberyl. I hate all that bulk under my jacket so a neck warmer would be perfect. I love it! It's so soft & warm. 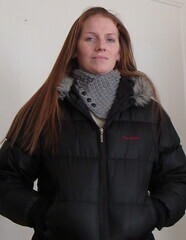 I'm planning on buying a new winter jacket this weekend & when I do I'll be back at cherylboberyl.etsy.com for a new neck warmer!